It is my hope that each of you are experiencing the season of Lent in profound ways. 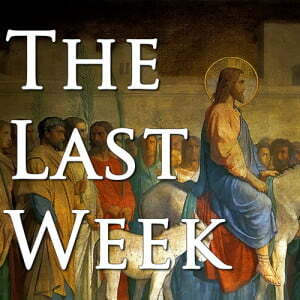 We continue this month in the exploration of the Gospel of Mark’s telling of the last week Jesus spent in Jerusalem. We’ve considered the contrast between Jesus’ procession into Jerusalem on a donkey and Pilate’s show of force as each came into the city for the Passover festival. We’ve explored the reasoning behind Jesus’ anger in the Temple the following day and how its framing with the story of the fig tree offered perspective and understanding. We’ve experienced the rising tension as Jesus continues to challenge the authority of the scribes and Pharisees even in the face of testing and trickery. And we have much to look forward to this month, including: messianic prediction and betrayal; a Passover meal that is profoundly changed, followed by arrest and interrogation; and crucifixion and death and the scattering of the disciples. This Lenten exploration is a good thing. We must take time for study, for introspection, to seek out deep and divine meaning in our lives and in the world we experience. And this season – like all things – must come to an end. Indeed, it is a time of preparation. We are preparing for Easter. We are preparing for resurrection. I have shared in worship about the journey toward ordination in The United Methodist Church, not only as I have experienced the journey but as we have a candidate in our congregation exploring this same journey. In my recent set of interviews, I was asked about how I understand resurrection and how it affects our lives directly. In short, I believe that resurrection is any awakening to new life. And I believe that we all have resurrection moments in our lives, sometimes without even knowing it. As a beach community, we may imagine being in the ocean and – as has happened to me a number of times – being forced under the water by the waves. Especially if we’re under water for longer than is comfortable, that first breath of air after breaking the surface feels like a miracle. It’s a resurrection moment. This congregation has been blessed with the ministry of the non-profit organization “Welcome Door” under prophetic leadership and compassionate mission. As these good leaders transition to other work and as the new non-profit “Shoreline Community Services” steps into this role, our guests experience new ideas and fresh perspective. It’s a resurrection moment. I’ve spoken with persons who have struggled with addiction. So many times, I’ve heard stories about hitting “rock bottom” and coming to the understanding of powerlessness and a profound need for the divine. It’s a resurrection moment. I can think of several times that I’ve been in deep theological conversation with someone who has intense questions about God and how God may be present in the world. Often, one or both of us comes away from that conversation with an expanded view of the divine. It’s a resurrection moment. As we come once again to the Easter celebration, let us open our eyes to the resurrection moments that happen in our lives. Let us experience an awakening to new life. Let us see the dawn of God’s light once again and understand that we are no longer slaves to darkness and fear. Friends, we are a resurrection people. Thanks be to God! During one of your sermons in the last week I realized that I too needed to be resurrected from drinking too much wine! After a time of prayer and dedication to “no more wine” I have been alcohol free. When I want a drink I tell myself I have had a resurrection and thank God.